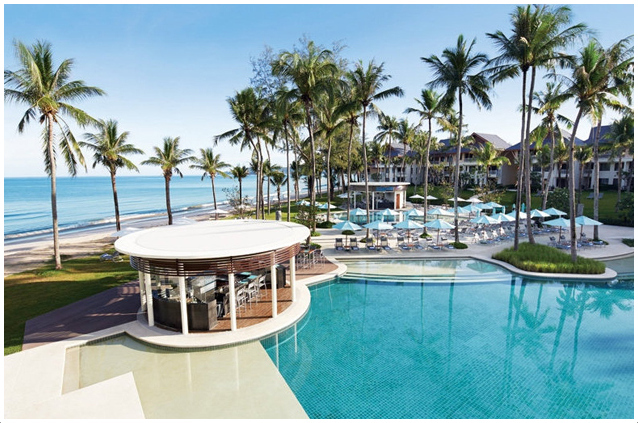 If only one thing could be said about The Outrigger Laguna Phuket Beach Resort at Laguna Phuket it would be that it delivers absolutely stunning ocean views that are among the best in Phuket. As one of an elite select few beachfront resorts in the Laguna Phuket Resort group, each of the resort’s several hundred rooms offer water views of either Thailand’s Andaman Sea or of the adjacent glistening lagoon. But that’s not all that’s impressive about the retreat. Newly remodeled in 2013, the resort’s architecture is superb and aesthetically astonishing. Guests will enjoy the exquisite blend of traditional Thai and modern architecture design that permeates throughout the entire estate and creates an understated elegance. The Outrigger has it it down to the smallest detail and has created a luxury resort that will make you feel like royalty while maintaining that inviting vacation feel. 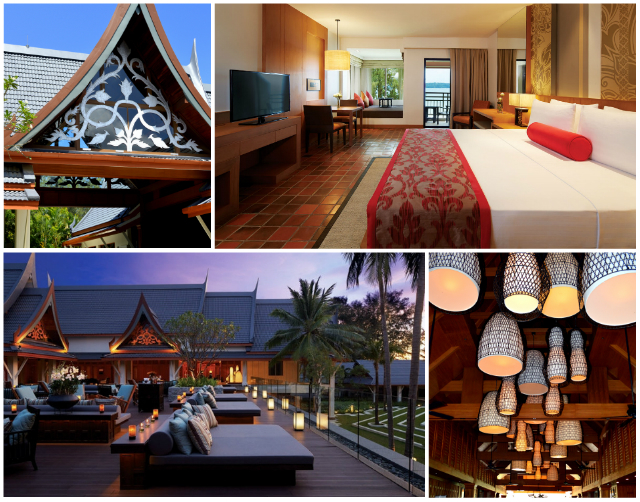 As part of a much larger community of resorts, The Outrigger Laguna Phuket Beach Resort at Laguna Phuket enjoys an association with the expansive Laguna Phuket property that provides guests with an even wider array of things to experience. 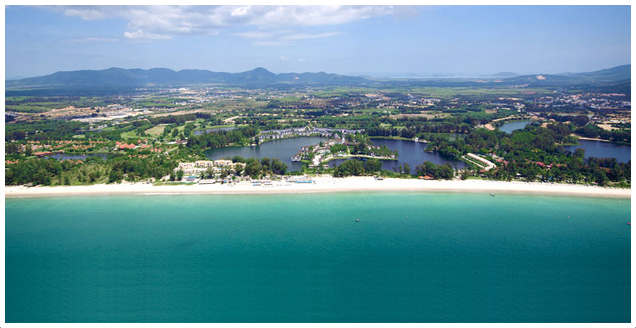 Laguna Phuket contains 7 deluxe hotels and villas across 1,000 acres of tropical parkland and eight kilometers of beach. The The Outrigger Laguna Phuket Beach Resort at Laguna Phuket guests are welcome on any of the other resort properties and the nearly 30 restaurants and bars shared between them. Amenities include an 18-hole golf course, shopping center, bicycling, kayaking, sailing, canoeing, tennis, squash, as well as the daily in-house activities offered by the resorts. A complimentary bus and boat shuttles connect visitors with the other properties. The Outrigger Laguna Phuket Beach Resort at Laguna Phuket goes to great lengths to make guests with families feel welcome. 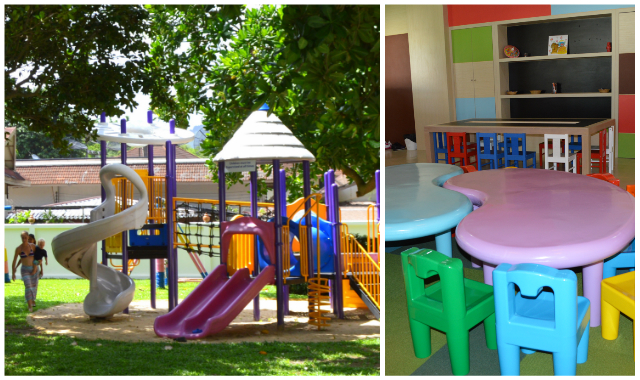 This family friendly philosophy is reflected in the resort’s family oriented amenities. The hotel boasts an in house daycare center where guests can drop off the little ones for adult supervised activities (Note: this feature requires an additional charge). 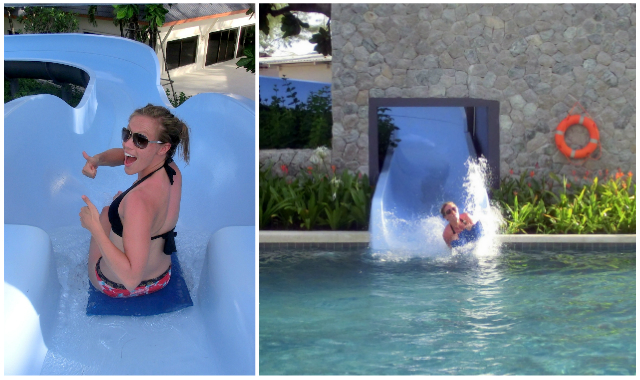 Aside from the daycare, the main pool also has a fun water slide - one of the few in Southern Thailand - that will provide hours of entertainment for the family. 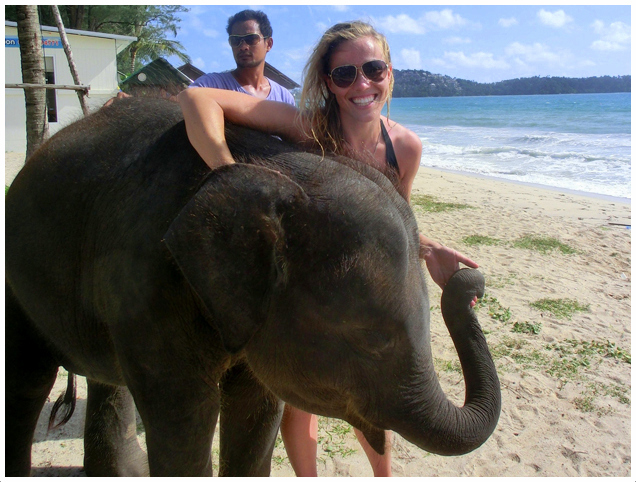 One of the most exciting features of the hotel is the Elephant Experience. Imagine relaxing poolside as a live elephant walks right past you, grazing your chair with his tail. The Outrigger Laguna Phuket Beach Resort at Laguna Phuket is home to several stunning elephants that are taken on “walks” around the property twice a day. Guests are encouraged to feed, pet and take pictures with the impressive animals. Make sure to take advantage of this experience as it’s a unique opportunity to play with elephants and definitely something you will never forget. The beachfront pool is absolute paradise. The architecture is modern and sleek. It features one main pool that houses the water slide, a sport pool (for water polo, etc. ), and a wading pool for small children. The Outrigger Laguna Phuket Beach Resort at Laguna Phuket offers three restaurants: two are in the main structure and the third is a poolside bar and grill. Of the two restaurants located in the main structure, (one on the upper floor, the other down below) the upper restaurant serves a fantastic buffet that consists of a mixture of Thai and Western foods.The lower floor is home to a more traditional restaurant where guests can order off a preset menu. A mixture of both Thai and Western foods are also offered there. If guests desire to go outside The Outrigger for meals, reservations can easily be made through the front desk for any of the other Laguna Phuket restaurants. Each stateroom contains a booklet that provides guests with more information on the types of dining options available to Laguna Phuket guests. 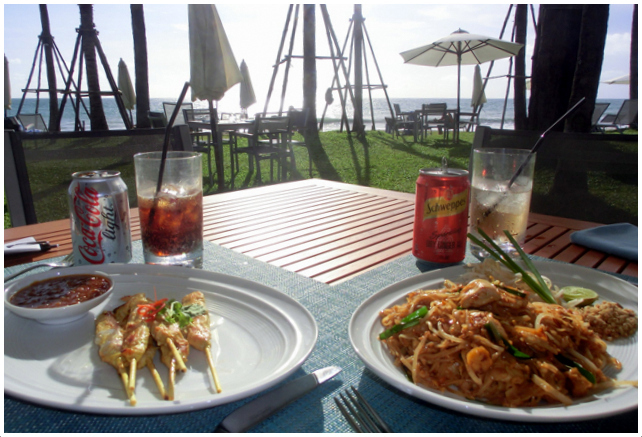 The staff and service at The Outrigger Laguna Phuket Beach Resort at Laguna Phuket is beyond exceptional. The entire staff is friendly and eager to make your experience as enjoyable and personal as possible. Guests are welcomed with flowers and a cool beverage upon arrival. Staff members working the front desk speak fluent English so those not conversational in Thai can still easily communicate. 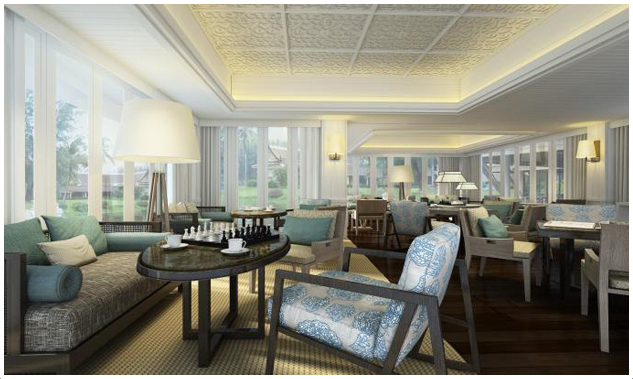 The Club reception and lounge features a start to finish private and personal luxury resort experience. Upon enrolling to be “members” of this exclusive club you will enjoy access to a full breakfast buffet, afternoon tea and cookies, live entertainment, and best of all, a serene and pampered ambiance. The Outrigger Laguna Phuket Beach Resort at Laguna Phuket also offers a numerous amount of other services including private chauffeurs into Phuket City, airport transfers, an activity desk to help plan all your daily adventures. Bang Tao Beach is a stones-throw away from the any room in the resort and easily accessible from anywhere on the Outrigger property. 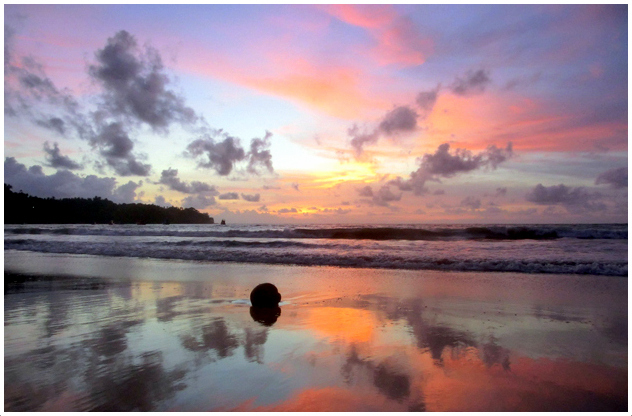 Take advantage of early morning yoga, rent a surf board, or enjoy a romantic walk at sunset. 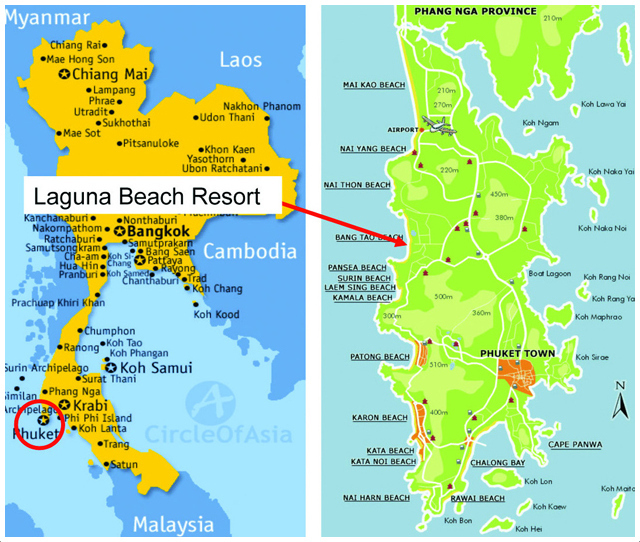 The Outrigger is about 20 minutes southwest of the Phuket airport. Guests can either arrange for the chauffeur service through the hotel or hire a taxi. From Phuket City, the Outrigger is a bit farther, travel time is roughly 40 minutes depending upon traffic.